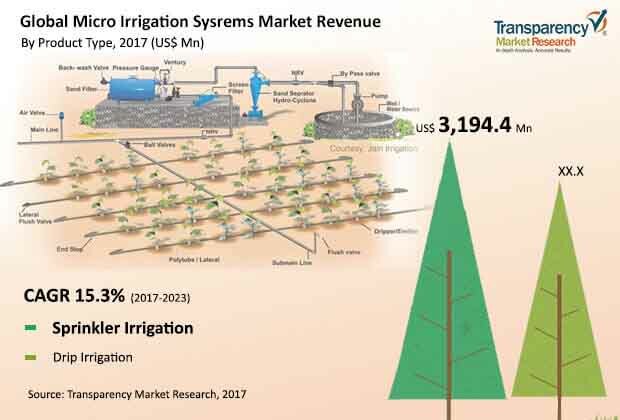 Owing to large number of players in the global micro irrigation systems market, it is anticipated to witness tough competition, along with being highly fragmented. However, Netafim Ltd., Jain Irrigations Systems Ltd., and The Toro Company are the key players that accounted for maximum market share in 2014, with wide range of product portfolio. The firms are working on having better research and development capabilities, coupled with technological advancements. This is foreseen to help the growth of the firms in coming years, with better market position. Sistema Azud SA, Rivulus Plastro Ltd., Lindsay Corporation, Valmont Industries Inc., T-L Irrigation Company, are some other key players leading the global micro irrigation systems market. Companies are indulging into various mergers and acquisitions and collaborations to sustain their existing position and improve it in the span of coming years. According to Transparency Market Research (TMR), the global micro irrigation systems market, is expected to project a strong CAGR of 15.3% within the forecast period from 2017 to 2023. Application-wise, the large corporate and private farming segment is foreseen to account as a leading segment with 52.4% of the entire market by 2023. Geographically, Europe accounts for major share of the micro irrigation systems market in terms of revenue. Support from the government regarding the adoption of micro irrigation systems is a key factor behind the development of micro irrigation systems market. The declining level of ground water has called for some critical goals for the issue, for example, reception of micro irrigation. Micro irrigation is feasible as it helps spare 50-60% water than what is utilized in stream irrigation and other conventional irrigation strategies. Because of this, various governments are empowering the utilization of micro irrigation and offering concession in deployment cost of micro irrigation systems. A few governments, for example, those of Norway, India, and Switzerland are additionally encouraging the popularity of micro irrigation systems. For instance, in India, the state administration of Tamil Nadu has reported 100% financial support for small agriculturists taking up micro irrigation and 75% for the other farmers as well. Furthermore, rising water shortage particularly in agrarian nations of Africa and Asia Pacific is requiring manageable water irrigation systems. Rising temperatures in atmosphere and episode of dry seasons as of late have brought about declining surface and ground water requiring other strategies for irrigation of farming land. Reception of micro irrigation systems enables in water conservation as well as streamlines water utilization for irrigation of substantial areas. In any case, high starting capital required for micro irrigation systems makes them less reasonable for low-value crops, taking into account that it has low return on investments. Surging expense of micro irrigation systems makes them unreasonably expensive by small farmers, and make them appropriate for cost-concentrated farming.